It is reported that there was a fuel hike from last night and later the President has mediated and brought the price down; thus giving rise to a state of crisis. were sold. But the President has instructed the Petroleum Corporation now to issue fuel at the old price. As such what we want to know first of all whether cabinet approval has been obtained for this. The other thing is that the government should make an announcement as to what procedures the President is going to adopt in the case of the President bringing the price down once more when it has been increased by Petroleum Corporation". According to the price formula of fuel prices, the Ministry of Finance has taken steps to increase a litre of petrol by Rs. 8 from last midnight and a litre of diesel by Rs. 9. According to the present price formula fuel prices are being revised once every two months and the next revision of fuel prices is to take place once again on next September the 5th. The decision taken to effect an increase of fuel from midnight yesterday being suspended from this morning has resulted in a problematic situation of fuel distribution islandwide. 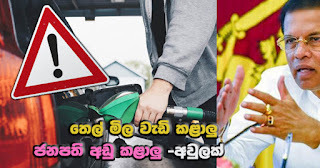 Fuel price hike launched by the Finance Ministry being withheld by the President this morning has resulted in activities of fuel distribution by Petroleum Corporation coming to a standstill by now.